Not all the cars at the annual gathering are decades old. Automakers are also out to attract new customers. 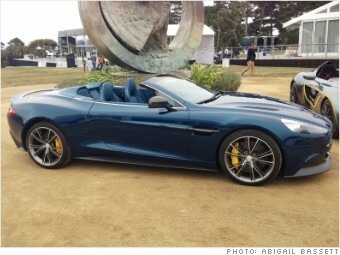 Aston Martin held the global unveiling of the convertible version of the Vanquish at Pebble Beach. Like the Vanquish, the Vanguish Volante has a 565-horsepower 5.9-liter V12 engine. It just has a roof that folds down instead of a closed top. Of course, that can make all the difference.